Oh! 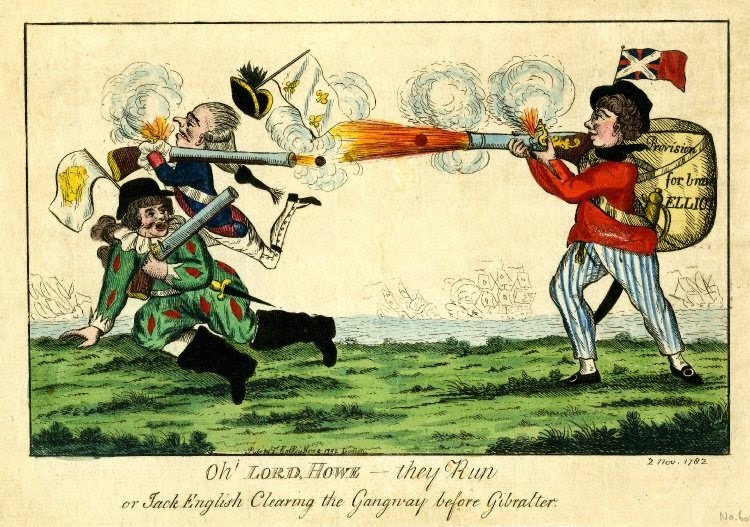 Lord Howe - they Run, or Jack English Clearing the Gangway before Gibraltar, Thomas Colley, 1782, British Museum. I missed this print time and again, but it was brought to my attention by the excellent 18th Century Material Culture Resource Center. Check it out! 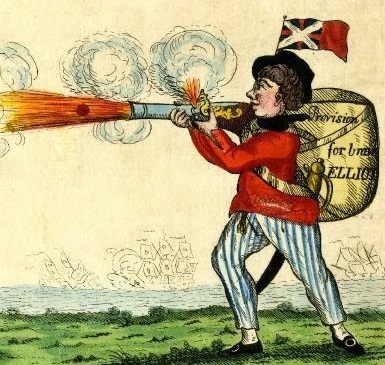 In a typical caricature of the British sailor, Jack English gives Spain and France a thrashing! This print celebrates the Great Siege of Gibraltar, a much vaunted success of the British over the allied forces during the American Revolutionary War. Jack English wears a black round hat with a narrow brim, a black neckcloth, and a single breasted red jacket. His close fit trousers are of the broad fall type, and with vertical blue stripes. What the Hell do we call these?